Just go here to see Mimi Kirchner's tiny worlds. That's what I'm doing. I'm making itty bitty houses with itty bitty trees and windows and snowmen. Good grief. I don't know why but this is deeply satisfying. Just blame my pal Denise from Grrl + Dog for leading me astray. I have to try the toadstool fairy houses and the lighthouses...have to. the hell with shortbread! I love the funky little tree with apples on it, reminds me of a child's painting. 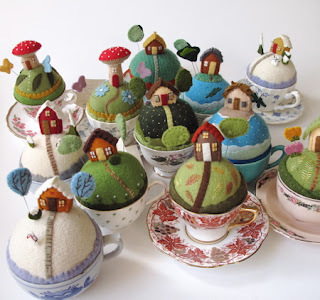 So is everyone in your house getting a tiny world pincushion for Christmas?? Thanks Karen - it is insane how caught up in these I am!